Tampa,Fla. 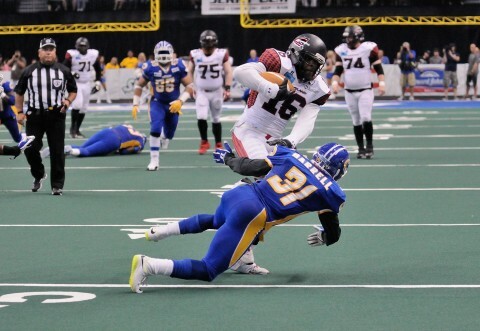 — The Cleveland Gladiators and the Tampa Bay Storm entered Saturday’s night game with playoff implications. 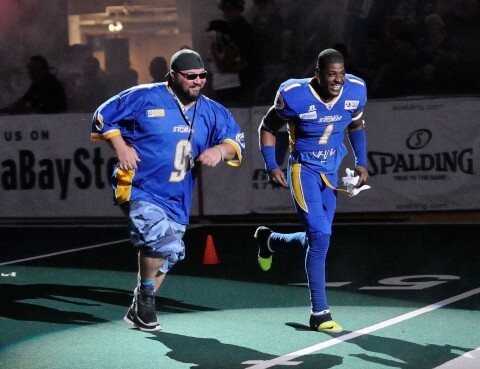 The storm needed a win to get in and the Gladiators, who already clinch a spot in the post season party, could clinch home field though out with a win. Neither team would give in easily but is was Cleveland on to a Gladiator of a victory 56-49. The Gladiators rode the arm of QB Shane Austin who was a perfect 24 of 24 for 273 yards. Austin’s 5 TD passes in the game gave him 99 on the season just one short of a Cleveland record. WR Thyron Lewis caught 10 passes for 119 yards and three TDs. The Gladiators finished the season at 17-1. The bright spots for the Storm wrapping up the regular season at home; QB Randy Hippeard ran for two TDs giving him 16 on the season and rushing Tds in seven straight games. Hippeard threw for 248 yards (20-38 and 4 TDs). Joe Hills had 10 receptions for 119 yards. It was the largest attended AFL game of the season 14,770, ahving the Storm end the season with 4 of the top 10 attended games this season. Attendance of 14,770 is the highest in the League this year. 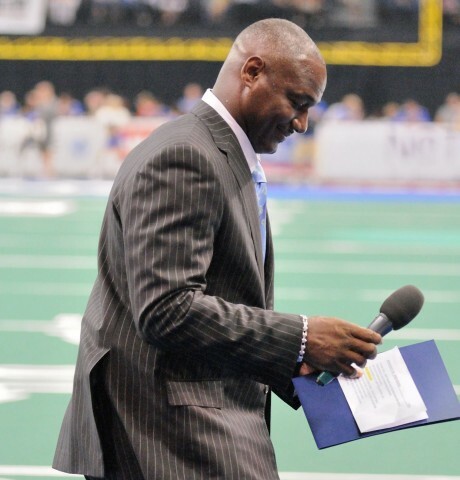 Pro Football Hall of Fame 2014 Inductee and Storm owner Derrick Brooks was on hand to thank fans for their support during the 2014 season. 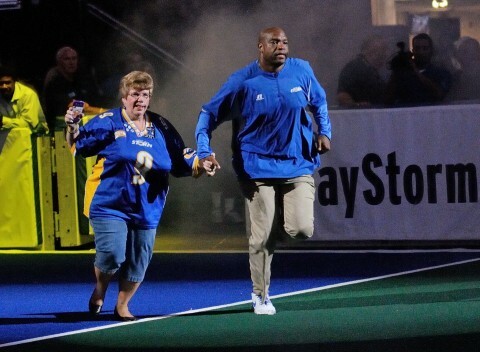 T.T Toliver and his adoring season ticket member are all smiles as they take the field. 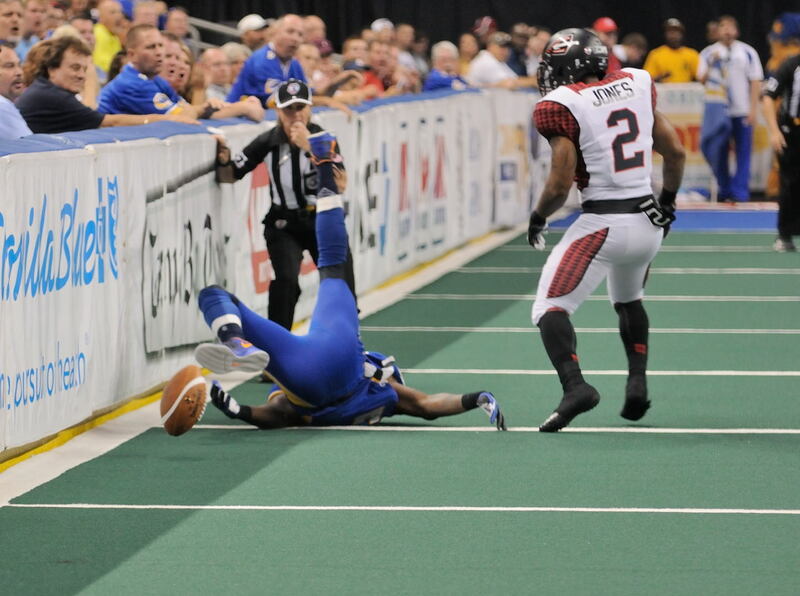 FUMBLES: Cleveland Gladiators-JACKSON, LaRoche 1-1. 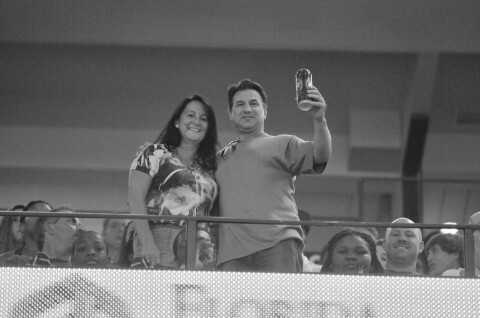 Tampa Bay Storm-LINDSEY, Michael 1-1. 2  JONES, Dominic          4    1  4.5     .     .   .     .      1    .      .     .
1  NORMAN, Marrio          4    1  4.5     .     .   .     .      1    .      .     .
5  PHINISEE, Joe           4    . 4.0     .     .   .     .      .    .      .     .
20 BUTLER, Gary            3    1  3.5     .     .   .     .      .    .      .     .
15 POLLARD, Royce          3    . 3.0     .     .   .     .      .    .      .     .
3  JACKSON, LaRoche        1    1  1.5     .     .  1-37   .      .    .      .     .
17 TAYLOR, Collin          . 1  0.5     .     .   .     .      .    .      .     .
21 FANOR, Jean             8    3  9.5     .     .   .     .      .    .      .     .
23 PAYNE, Darian           5    . 5.0     .     .   .     .      .    .      .     .
31 HARRELL, James          4    1  4.5     .     .   .     .      .    .      .     .
14 DIX, De'Audra           4    . 4.0     .     .   .     .      .    .      .     .
15 BURDEN, Randall         3    1  3.5     .     .   .     .      2    .      .     .
55 JACKSON, Dexter         2    . 2.0     .     .   .     .      .    .      .     .
9  BONGARRA, Juan          2    . 2.0     .     .   .     .      .    .      .     .
93 CLEBERT, Richard        1    . 1.0     .     .   .     .      .    .      .     .
90 FORTE, Julius           . 1  0.5     .     .   .     .      .    .      .     .
52 MCCULLOUGH, Alfred      . .   .      .     .  1-0    .      .    .      .     .
WR   17 TAYLOR, Collin                         WR   1  TOLLIVER, T.T. 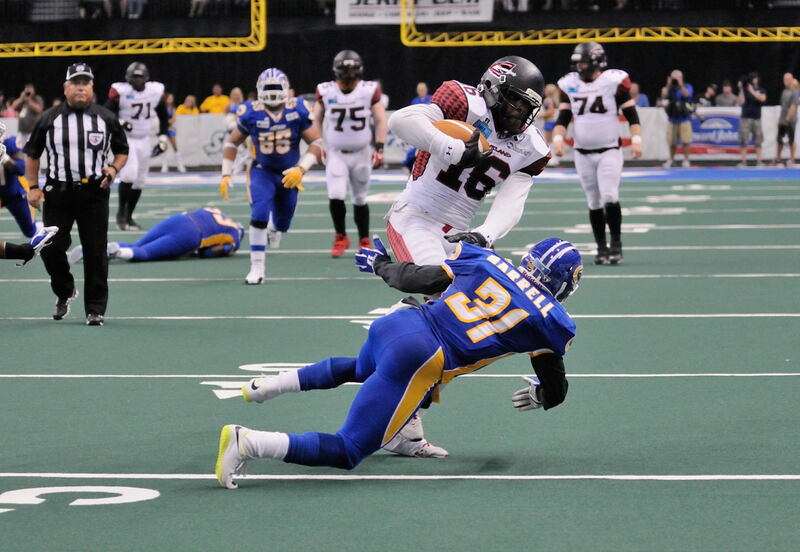 Cleveland Gladiators: 4-PETTREY, Aaron, 15-POLLARD, Royce, 45-JONES, Jason, 92-DANIELS, Alex. Tampa Bay Storm: 3-DIXON, Chris, 6-ISSAC, Rod, 9-BONGARRA, Juan, 10-LINDSEY, Michae, 14-DIX, De'Audra, 90-FORTE, Julius. Storm-HIPPEARD, Randy 20-38-0-248; DIXON, Chris 1-1-0-1; TEAM 0-0-0-minus 3. INTERCEPTIONS: Cleveland Gladiators-None. 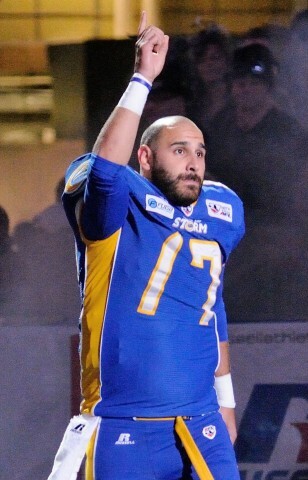 Tampa Bay Storm-None. Tampa Bay wins the toss and will defer. C 1-10 C00   TBY ball on TBY0. yards to the CLE17 (FANOR, Jean). 1ST DOWN CLE (BURDEN, Randall). PETTREY, Aaron kick attempt good. C 1-G  C00   Clock 12:35. T 1-10 T20   TAMPA BAY STORM drive start at 12:35. T 1-10 T20   HIPPEARD, Randy pass incomplete to HILLS, Joe (JONES, Dominic). T 2-10 T20   Timeout Tampa Bay Storm, clock 11:23. T 2-10 T20   HIPPEARD, Randy pass incomplete to TOLLIVER, T.T..
T 3-10 T20   HIPPEARD, Randy rush for 7 yards to the CLE23 (MCGINNIS, Willie). 1ST DOWN TBY, TOUCHDOWN, clock 09:54. BONGARRA, Juan kick attempt good. T 1-G  T00   Clock 09:16.
yards to the CLE14 (FORTE, Julius;FANOR, Jean). C 1-10 C14   CLEVELAND GLADIATORS drive start at 09:16. 1ST DOWN CLE (BURDEN, Randall;FANOR, Jean). C 1-10 T15   AUSTIN, Shane pass incomplete to GOODMAN, Dominick. C 2-10 T15   AUSTIN, Shane rush for 8 yards to the TBY7 (PAYNE, Darian). C 1-G  C00   Clock 04:58. T 1-10 T01   TAMPA BAY STORM drive start at 04:58. T 1-10 T01   PENALTY TBY false start (ISOM, Byron) 0 yards to the TBY1. T 2-10 T11   PENALTY TBY false start (HILLS, Joe) 5 yards to the TBY6. T 3-8  T13   HIPPEARD, Randy pass incomplete to HILLS, Joe. (NORMAN, Marrio) 10 yards to the TBY23, 1ST DOWN TBY, NO PLAY. CLE11, 1ST DOWN TBY (JACKSON, LaRoche;NORMAN, Marrio). T 2-1  C02   Start of 2nd quarter, clock 15:00. 1ST DOWN TBY, TOUCHDOWN, clock 14:20. T 1-G  T00   Clock 13:47.
yards to the TBY24 (BONGARRA, Juan). C 1-10 T24   CLEVELAND GLADIATORS drive start at 13:47. 1ST DOWN CLE (FANOR, Jean). C 1-G  T07   AUSTIN, Shane pass incomplete to LEWIS, Thyron. 1ST DOWN CLE, TOUCHDOWN, clock 11:27. C 1-G  C00   Clock 10:47.
yards to the TBY10 (BUTLER, Gary). T 1-10 T10   TAMPA BAY STORM drive start at 10:47. T 1-G  C08   Clock 09:13. T 1-G  C08   HIPPEARD, Randy pass incomplete to TOLLIVER, T.T..
T 2-G  C08   QB hurry by NZEGWU, Louis. T 3-G  C11   HIPPEARD, Randy pass incomplete to JACKSON, Amarri. 1ST DOWN TBY, TOUCHDOWN, clock 06:44. Cleveland is challenging the call of Touchdown. Ruling of touchdown stands. Cleveland is charged a timeout. T 1-G  C02   Timeout Cleveland Gladiators, clock 06:25. Kick is good on a high snap. T 1-G  T00   Clock 06:21. BONGARRA, Juan kickoff 58 yards to the CLE-8, touchback. C 1-10 C05   CLEVELAND GLADIATORS drive start at 06:21. 1ST DOWN CLE (DIX, De'Audra). 1ST DOWN CLE, TOUCHDOWN, clock 04:01. C 1-G  C00   Clock 03:21.
yards to the CLE18 (POLLARD, Royce). T 1-10 C18   TAMPA BAY STORM drive start at 03:21. 1ST DOWN TBY, TOUCHDOWN, clock 01:57. T 1-G  T00   Clock 01:29.
yards to the CLE8 (PAYNE, Darian). C 1-10 C08   CLEVELAND GLADIATORS drive start at 01:29. C 1-10 C08   PENALTY CLE personal foul (JONES, Dominic) 4 yards to the CLE4. C 1-14 C04   1st and 10. C 1-10 C04   PENALTY CLE false start (25) 2 yards to the CLE2. C 1-12 C02   Clock 01:00. One Minute Timing rules in effect. Both teams have 2 timeouts. C 2-2  C12   Timeout Tampa Bay Storm, clock 00:54. 1ST DOWN CLE (HARRELL, James). C 1-10 T24   Timeout Tampa Bay Storm, clock 00:46. C 2-5  T19   Clock 00:39. C 2-5  T19   AUSTIN, Shane rush for loss of 2 yards to the TBY21 (HARDISON, Matt). 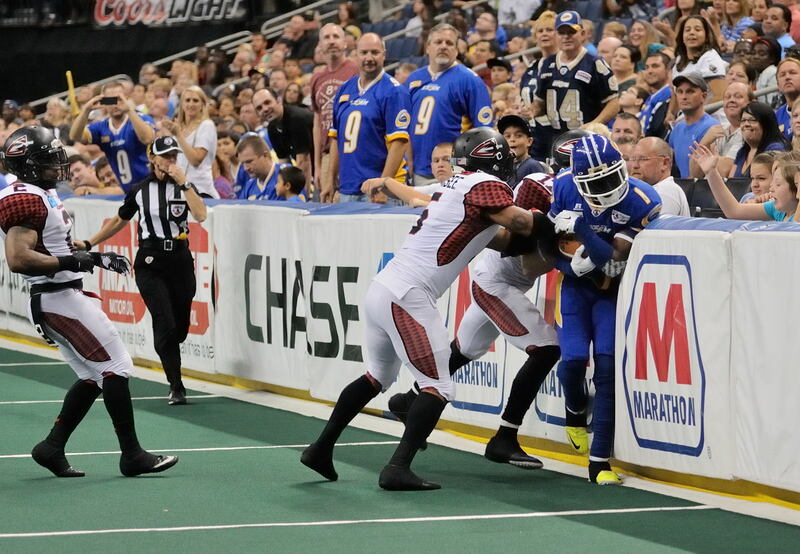 C 3-7  T21   Timeout Cleveland Gladiators, clock 00:26. C 1-G  T03   Clock 00:18. C 1-G  T03   JONES, Jason rush for 2 yards to the TBY1 (CLEBERT, Richard). 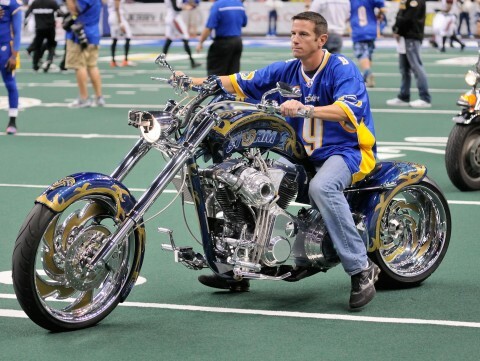 C 2-G  T01   Timeout Cleveland Gladiators, clock 00:11. DOWN CLE, TOUCHDOWN, clock 00:07. TAM 93 called for Roughing - will be assesed after the kickoff. PETTREY, Aaron kickoff 58 yards to the TBY-8, touchback. T 1-10 T05   TAMPA BAY STORM drive start at 00:07. TBY17, 1ST DOWN TBY, out-of-bounds (PHINISEE, Joe). T 1-10 T17   Clock 00:02. T 1-10 T17   HIPPEARD, Randy pass incomplete to JACKSON, Amarri. T 2-10 T17   Clock 00:00. T 2-10 T17   End of half, clock 00:00. T 2-10 T17   Start of 3rd quarter, clock 15:00, CLE ball on CLE0. T 1-10 T05   TAMPA BAY STORM drive start at 15:00. T 1-10 T05   TAMPA BAY STORM drive start at 13:35. T 2-21 T24   2nd and 21. T 1-10 C16   ISOM, Byron rush for 1 yard to the CLE15 (NZEGWU, Louis). T 2-9  C15   HIPPEARD, Randy pass incomplete to JACKSON, Amarri. CLE2, 1ST DOWN TBY (JONES, Dominic). T 1-G  T00   Clock 09:09. CLE 98 called for a PF after the play. Enforced after the kickoff. yards to the CLE2 (PAYNE, Darian). C 1-10 C02   CLEVELAND GLADIATORS drive start at 09:09. C 1-10 C02   PENALTY CLE personal foul (98) 1 yards to the CLE1. C 1-11 C01   1st and 10. C 1-10 C01   AUSTIN, Shane pass incomplete to TAYLOR, Collin. C 2-10 C01   AUSTIN, Shane rush for 7 yards to the CLE8 (PAYNE, Darian). yardline, 1ST DOWN CLE (FANOR, Jean). 1ST DOWN CLE, TOUCHDOWN, clock 06:03. TAM 53 called for Roughing. Will be enforced after the kickoff. C 1-G  C00   Clock 05:56.
off-setting, PENALTY CLE kick catching interference off-setting. T 1-10 T05   TAMPA BAY STORM drive start at 05:56. T 2-5  T10   HIPPEARD, Randy pass incomplete to JACKSON, Amarri. T 3-5  T10   HIPPEARD, Randy pass incomplete to JACKSON, Amarri (NZEGWU, Louis). T 4-5  T10   HIPPEARD, Randy pass incomplete to LINDSEY, Michael. C 1-G  T10   CLEVELAND GLADIATORS drive start at 03:27. CLE pass interference (TAYLOR, Collin) 10 yards to the TBY20, NO PLAY. C 2-G  T05   AUSTIN, Shane pass incomplete to LEWIS, Thyron, QB hurry by DUHART, Tommie. C 1-G  C00   Clock 00:19.
yards to the TBY15 (BUTLER, Gary). T 1-10 T15   TAMPA BAY STORM drive start at 00:19. T 1-10 T15   Clock 00:00. T 1-10 T15   Start of 4th quarter, clock 15:00. T 1-10 T15   PENALTY TBY false start (ISOM, Byron) 5 yards to the TBY10. (PHINISEE, Joe) 5 yards to the TBY15, 1ST DOWN TBY, NO PLAY. T 1-10 T15   HIPPEARD, Randy pass incomplete to TOLLIVER, T.T..
CLE11, 1ST DOWN TBY, out-of-bounds (PHINISEE, Joe). CLE3, out-of-bounds (JONES, Dominic;TAYLOR, Collin). CLE0, 1ST DOWN TBY, TOUCHDOWN, clock 10:51. T 1-G  T00   Clock 10:22. Penalty was Illegal Contact - can't find code for it. Gary) 30 yards to the CLE1, 1st and 10, CLE ball on CLE1. C 1-10 C01   CLEVELAND GLADIATORS drive start at 10:22. C 1-10 C01   AUSTIN, Shane pass incomplete to GOODMAN, Dominick. C 2-7  C18   AUSTIN, Shane pass incomplete to TAYLOR, Collin (BURDEN, Randall). DOWN CLE, TOUCHDOWN, clock 04:15. C 1-G  C00   Clock 03:34.
yards to the TBY-6 (POLLARD, Royce), touchback. T 1-10 T05   TAMPA BAY STORM drive start at 03:34. 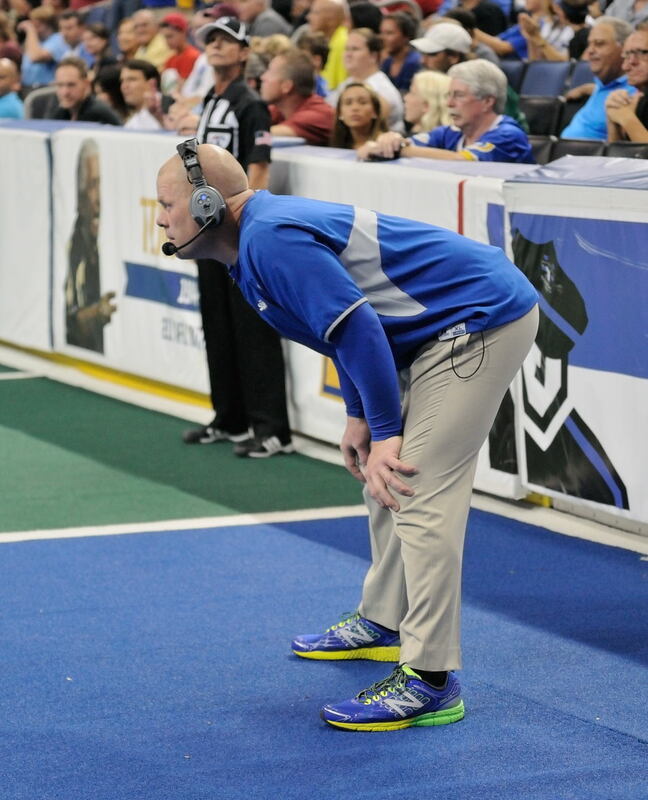 T 2-5  T10   Timeout Cleveland Gladiators, clock 02:39. T 3-5  T10   HIPPEARD, Randy pass incomplete to TOLLIVER, T.T..
(MCGINNIS, Willie) 10 yards to the CLE21, 1ST DOWN TBY. T 1-10 C21   1st and 10. CLE1, 1ST DOWN TBY (JONES, Dominic). T 1-G  C01   Clock 00:53. CLE on TBY15 (DIX, De'Audra). 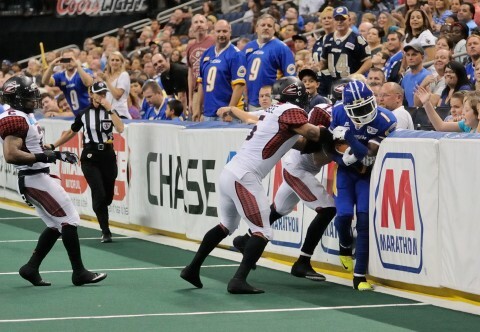 C 1-10 T15   CLEVELAND GLADIATORS drive start at 00:51. C 1-10 T15   JONES, Jason rush for 3 yards to the TBY12 (PAYNE, Darian). C 2-7  T12   Timeout Tampa Bay Storm, clock 00:42. C 2-7  T12   AUSTIN, Shane pass incomplete to TAYLOR, Collin. C 3-7  T12   Clock 00:36. C 1-G  T06   Clock 00:32. C 1-G  T06   JONES, Jason rush for 2 yards to the TBY4 (HARDISON, Matt). C 2-G  T04   Timeout Tampa Bay Storm, clock 00:26. C 2-G  T04   AUSTIN, Shane rush for no gain to the TBY4 (HARDISON, Matt). C 3-G  T04   Clock 00:21. C 3-G  T04   AUSTIN, Shane rush for 2 yards to the TBY2 (JACKSON, Dexter). C 4-G  T02   Timeout Tampa Bay Storm, clock 00:16. C 4-G  T02   Timeout Cleveland Gladiators, clock 00:16. C 1-G  T01   PENALTY CLE delay of game (AUSTIN, Shane) 5 yards to the TBY6. defense (HARRELL, James) 3 yards to the TBY3, NO PLAY. C 2-G  T03   End of game, clock 00:00.